Finding your future spouse is pretty incredible—but the next best feeling might just be finding the perfect wedding band for your engagement ring. If you have your heart set on a ring and band that fit together as seamlessly as you and your soulmate, today’s roundup is for you. 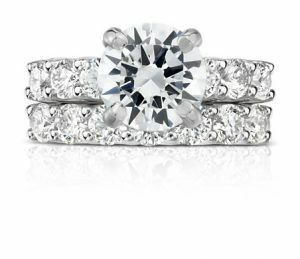 Below, we’re breaking down seven of our favorite engagement ring and matching wedding band combos. Read on to find your perfect pairing, all available at Blue Nile. 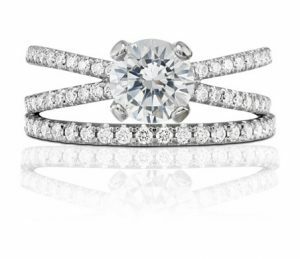 If a stunning solitaire paired with a simple band speaks to you, this matching set is right up your alley. 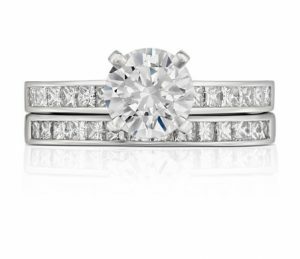 We love the simplicity of the micropavé band—it’s understated enough to pair perfectly with a larger solitaire engagement ring, while still having enough shine to look stunning all on its own. 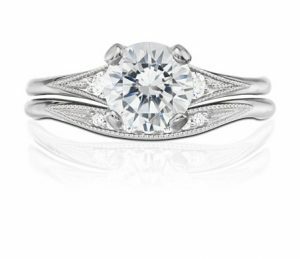 If you’re seeking an engagement ring/wedding band set that feels delicate and slightly vintage, this one’s for you. The unique curvature of each piece comes together to create an aesthetic that feels as storied as it does stunning. For those who want something as elegant as it is eye-catching, we’re obsessed with the intertwined style of this oh-so-pretty pair. 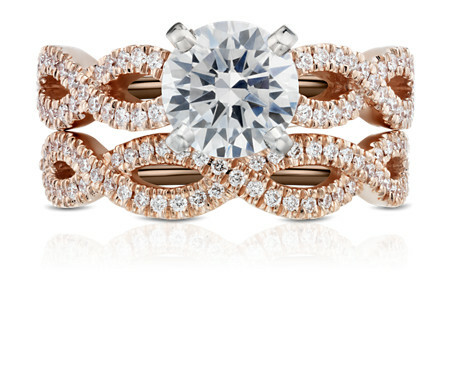 The twisted rows of micropavé diamonds feel super feminine and celebratory—especially in that dreamy rose gold setting. 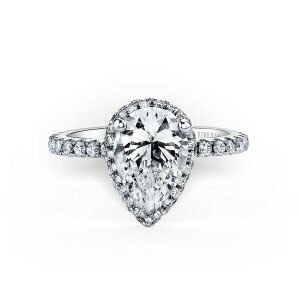 If your heart is set on a classic halo, this set likely speaks your love language. 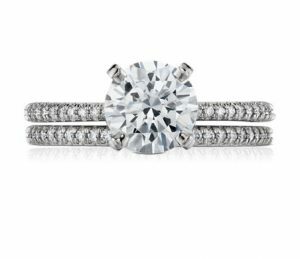 We love that the pavé diamond band pairs perfectly with the engagement ring, creating a seamless stack that feels like it was absolutely meant to be. We’re falling in fast love with this jaw-dropping set for anyone seeking clean lines and a classic aesthetic. When you stack the straight, simple eternity band under the split-shank style engagement ring, you’re left with a set that features geometric negative space and stunning, sharp-as-ever lines. 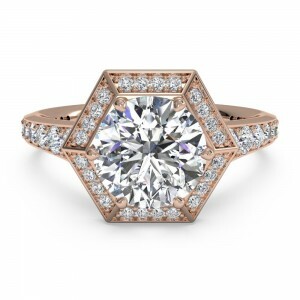 Seeking sparkle from every possible angle? This eye-catching pairing is all you. 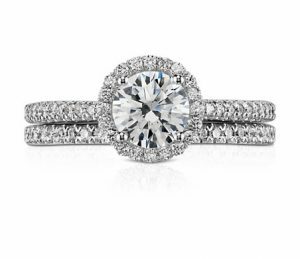 With an engagement ring featuring a set of six shared-prong diamonds that frame your center stone, and a band that boasts an additional seven round diamonds, this dreamy duo is all about showcasing striking stones (and we can’t be mad at that). Let’s face it—no ring round-up would be complete without a mention of the holy grail of cuts. 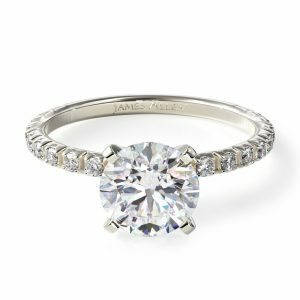 With 12 princess-cut diamonds in the engagement ring and another 14 in the band, this duo is as timeless and elegant as it is undeniably eye-catching.